You want to add a badge to your cart icon to show the number of items. In this article, we will see how to create a badge right above the cart icon using layer-list drawable. We will use layer-list drawable to show the cart and the badge. A layer-list is a drawable object that manages an array of other drawables. Each drawable in the list is drawn in the order of the list. The cart icon will form the first layer and the badge will form the second. The second layer will be transparent initially which we will fill later with a circle and write some text, for example, a quantity showing the order items count. Since the last drawable in the list is drawn on top, we will have the badge as the last item. Each drawable is represented by an element inside a single element. If you want to just view the layers, swap the items and add a drawable color instead of transparent. If we draw a circle around the transparent drawable at x,y=(width,0) and radius width/2, the circle will look pretty big. When you modify the code and run, this is what we see. If the radius is width/4, the circle seems to be a bit small than what we are expecting. If the radius is width/3 or (width/4 + 2.5), size of our circle looks better. Let’s add an increment of 2.5F to width/4. The first one is at width,0 and second one is at width – radius, height – radius. 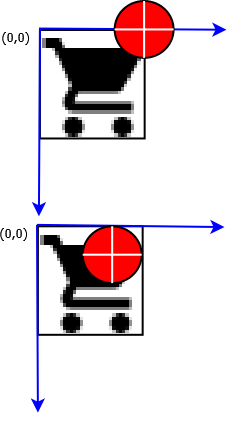 When you run, the circle looks as if it is pushed down the cart. If we place the text at circle’s x and y coordinates, we loose some of the text in the top. We will find the text’s rectangular boundary and then add to the y coordinate half of the text’s width. If quantity is 10, the circle looks a bit closed in so we will no have to adjust the circle’s size if the qty is >= 10. 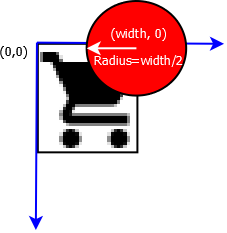 Now we can’t see the bottom portion of the cart, let’s re-adjust the circle coordinates. Bade Icon drawable badge_icon.xml contains the cart and the transparent badge. Our main page contains just a text item. In onPrepareOptionsMenu(), we will create the badge drawable and force it to redraw itself. Our cart menu item’s icon is composed of the cart icon and the badge drawable. Badge drawable is transparent, once we know the count of order items, we will force it to re-draw itself. In the draw() of the BadgeDrawable, we will paint the circle and the order quantity. First we need to find the menu item. Next, we will get the icon’s drawable object. We know the drawable object is composed of the cart icon and the transparent badge. Our goal is to repaint the badge drawable so find the badge drawable layer. Set the order item quantity to our custom badge drawable. We will see the class in our next section. Call to BadgeDrawable.setCount() will force the drawable to redraw itself. Replace the transparent drawable layer with the badge drawable we created. Reset the cart item’s icon. If the quantity is 0, you will not see the badge. BadgeDrawable is a custom Drawable, we create two Paint objects, one for filling the circle and the other to write the quantity. This was an example about creating Android badge using layer-list drawable element.